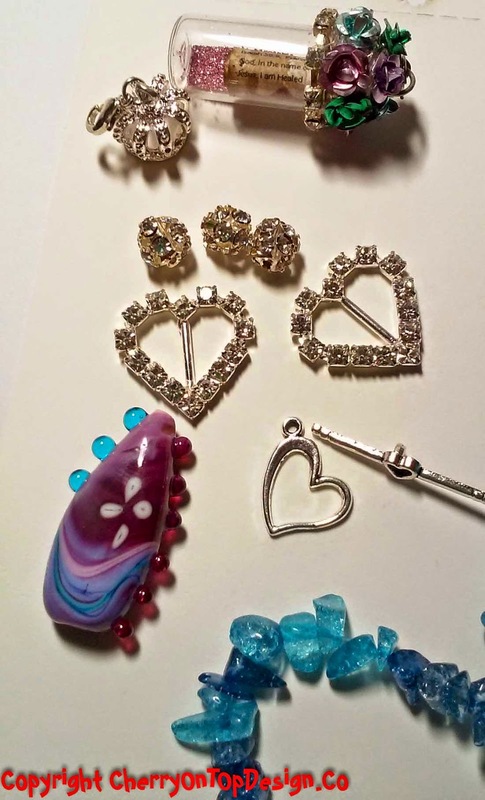 From the Bead Board : It's the Bead Peeps Swap N Hop TA-DA! Party! It's the Bead Peeps Swap N Hop TA-DA! Party! Welcome to the #BeadPeepsSwap N Hop!! Wooooweeeee! What an INCREDIBLE few months! In January the Bead Peeps Team sent out a challenge to those in our group to pair folks who signed up, with a partner....exchange beads.....make something.....and then all post on the same date, what we made. Quite a CHALLENGE! As the hostess, it was something I've never done before and it was certainly an adventure for me. But more on that another day. The task at hand is - soooo....what'd ya make? Because I was the hostess, when I was finished matching everyone I had 1 gal left over. So, I took her as an extra partner - and boy am I glad I did! 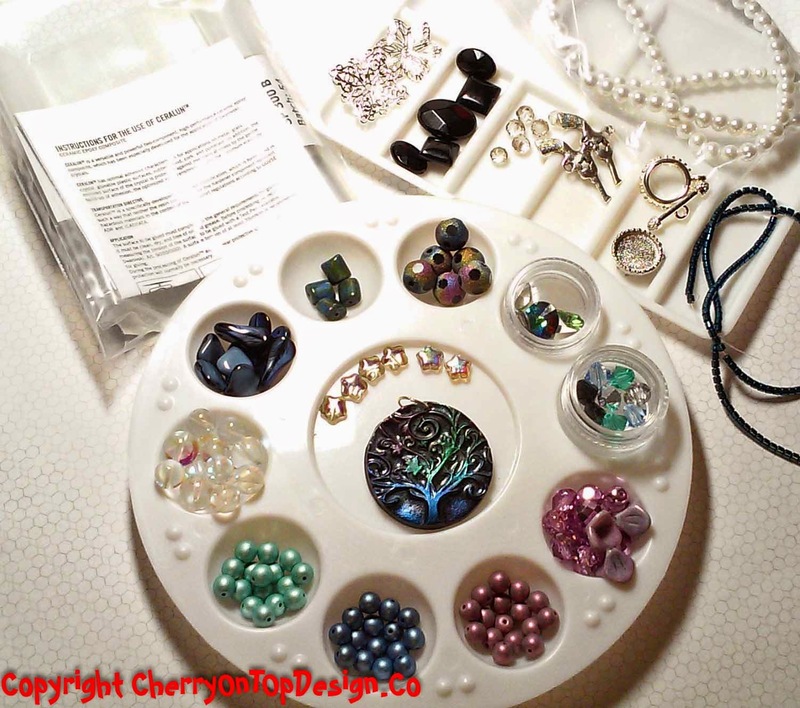 I had Marica of Bead Lovelies who happens to live in Malta. 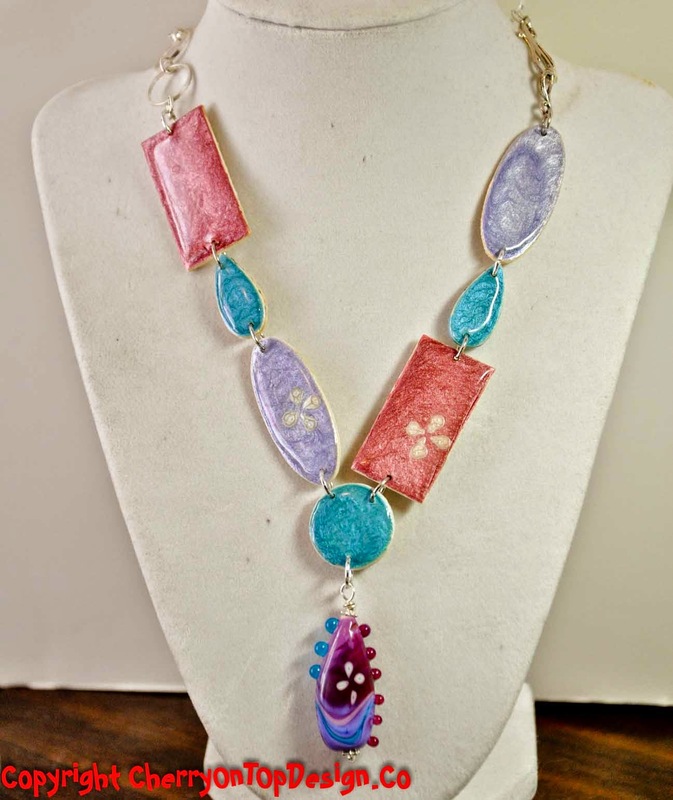 (An island nation off the coast of Sicily) She creates polymer clay components and makes beautiful jewelry! Jessica lives in Alaska. She has a family of 6 children (#6 was born during the challenge!) and they are gold miners. She is a lampworker, metal worker and jewelry designer. Yeah - these went into the "Private Collection"
Being someone who works in bright colors, opening my package to see brown, copper, tan and khaki with a pinch of gold and green thrown in - nearly made me cry. What the flim-flam would I do with THAT?!?! I sat on it - for a looooong time. I'd pull them out.... mix and match this and that....put them away. I'd pull them out....mix and match this and that.....put them away. You get the idea. I consulted friends, who offered great suggestions! I just couldn't get "into" it. (I realized I was trying to match the accent gorgeous seafoam green accent color on the tiki - nearly impossible when you're purchasing online) Until one day, it finally hit me! 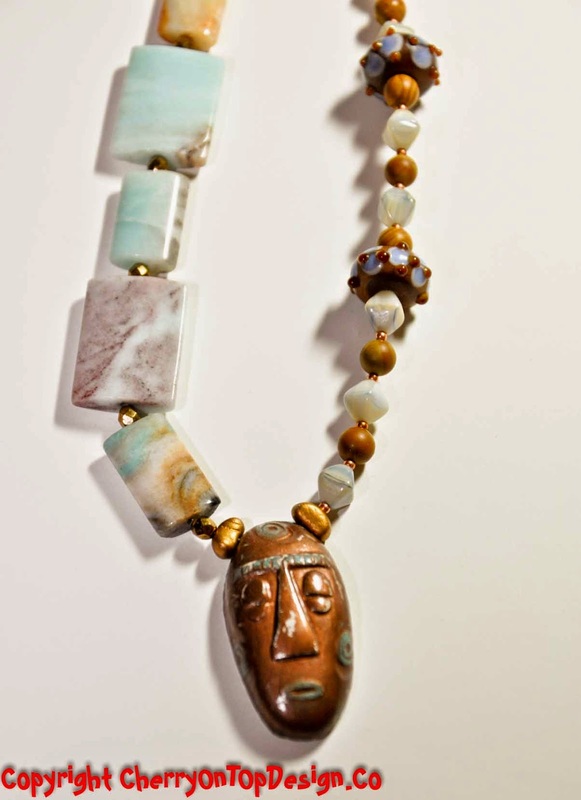 Tiki's are typically found around beaches...... how's about some amazonite? JACKPOT! 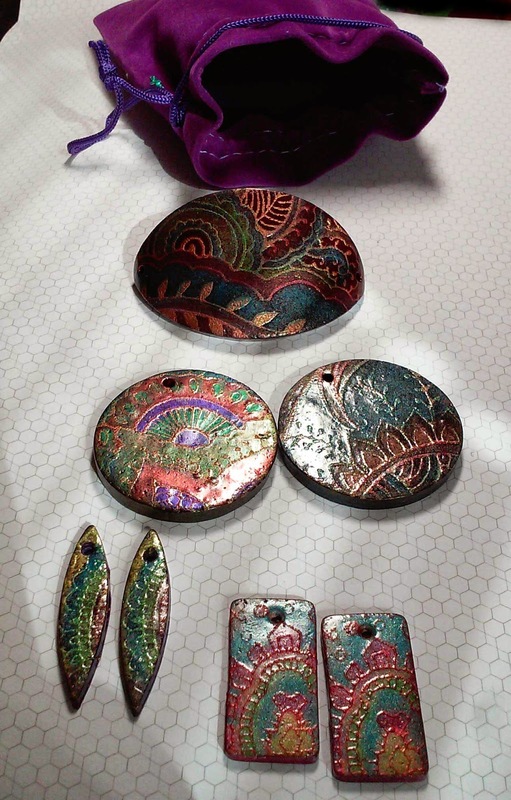 I pulled those babies out, put them with the STUNNING little copper, fire polish beads Marica had sent and WHAM! I have a piece! Except. It's heavy. REALLY heavy - both in physical weight and in visual weight. Curses! I REALLY wanted to use some more of the beads Marica had sent. She sent quite a large bag of the little round jaspers. So, I set out to make a multistrand piece - mostly because they are beautiful and frankly - a challenge. I played and played and played. I didn't want the spacers to be all copper, since the other piece I made was all copper - so I pulled out some seed beads (gasp!) that were a free gift, in all different metals and alternated them. It gave the piece mixed metals, and added a little drama. I used one of the clasps that she had sent (which I think is tre-chic!) in the leaf shape. So, I wanted something that would compliment it, on the other side. The acorn was a piece I had in my stash and thought it went really well with the leaf shape of the other clasp, so the acorn it was (hey - kinda earthy - huh?). And yes - you can detach the necklace part and use as a bracelet. BOOM! Jessica's package was also, quite a challenge for me. I had chosen Jessica for several reasons...1. I thought it was AMAZING that she lives in Alaska 2. We have a very common thread of faith that runs through us 3. She just seemed like a sweetly cool chick. As I mentioned earlier, Jessica is a metal smith, lampworker and dabbles in many other things that have to do with fire. I was QUITE excited when my package arrived from Alaska. So VERY cool! I think my largest challenges with this package was that it's asymmetric (as we have seen earlier, I've not done anything like that before) and featured both opaque AND transparent glass. It's tough to mix the 2 different types and get a great result. SO, I had to figure out something that would speak to both the opaque heavy and the transparent lightness. I thought long and hard about this one. I had this idea to use some of the connection pieces that I've started making, and see if somehow I could tie everything together with them. SHOCKINGLY, I had already purchased the colors that happened to be in her piece! So, I set out to make different shapes and sizes that would compliment and tie the shapes and colors together. Each is hand painted (including the flowers to mimic her piece), hand resined and I punched the pieces with my new handy-dandy itty bitty hole puncher. I've never made a piece like this and I've NEVER made (or used) a 3 way connector before. I'm REALLY proud of this piece and LOVE how it came out! Overall - I'm SO PROUD of myself for rising to the challenges. One thing, that's been REALLY important to ME with these challenges, is that I learn something new with each one. I feel like I'm robbing myself of the experience, if I don't do something new to me. Beyond that, it helps me to feel comfortable trying something out of the box and not being afraid to fail and try again. THAT is why I love challenges like this. You NEVER know what you're going to learn and how you're going to be stretched. Check out all my friends who participated! LOVE the third piece, those connectors you made work really well with hers. And that second piece! So.so.cute. and it's doing double duty! OMG I absolutely LOVE what you did with the tiki partner :-) Pure perfection. Not in a million years would I have thought to use it like that. Just beautiful. What a great idea to make a convertible piece with that clasp. Love it love it love it. The color combo on that one is divine. And the final piece, WOW! The colors are out of this world beautiful. And it looks like your lovely components were made for that focal. Great job! So happy that you got to try new things. You rose to the challenge beautifully my friend. So very proud of you. I could finish commenting without thanking you for organizing this wonderful challenge. I have no idea how one can do such a big event and remain sane haha Bravo! I must say that from all the blog hops I've come across this was the most well organized of them all. Well done! Hi Linda, First let me say thank you for being a great hostess. This event was lots of fun. 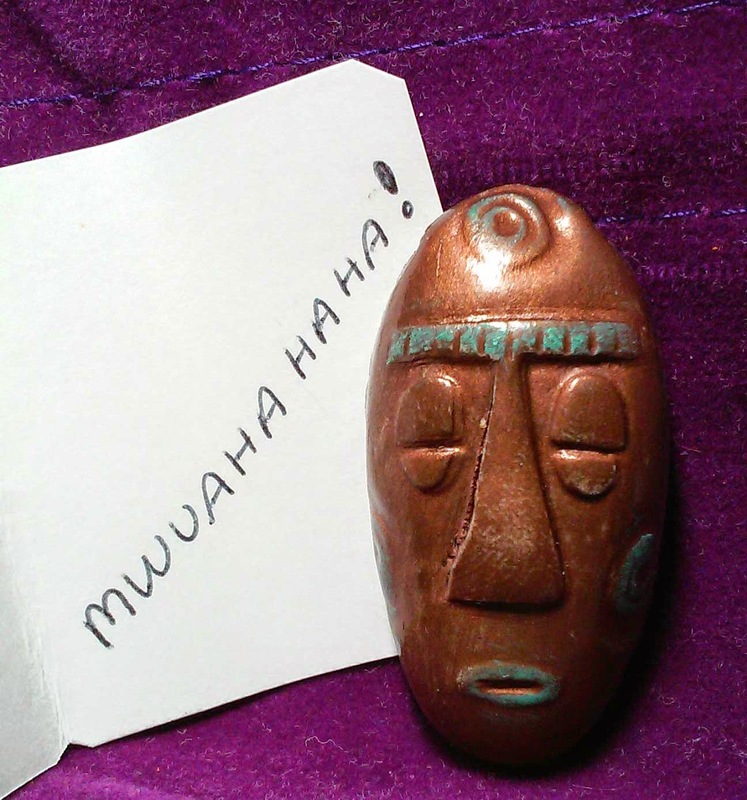 The amazonite that you chose to go with the Tiki head was the perfect choice. Piece number2 is way cool for being able to wear it two way. I like how you put the colors together in this one. Kudos to you for trying new things in this challenge. The third necklace is bright and beautiful. I agree that stretching ourselves is what these challenges are all about. Good job. Ooh Linda I love all your pieces. Awesome. Thank you so much for hosting, you rock!!! Thanks for organizing this little virtual party. You've done a great job, for you first time, or any time. I'm glad you finally found the right stones to go with the tiki head. I knew you'd get there. If you can work with baby food orange, you can do anything. Well done all around. Thank you, Linda, for putting this swap together! I love what you did with the tiki head piece. I would have been befuddled with a focal like that, but you figured it out and it looks awesome! Thank you so much for taking on this huge event! I'm glad I was able to join everyone in this big swap. Love that you were able to challenge yourself. That is what it is all about, working with something that you didn't pick out. You did a great job! 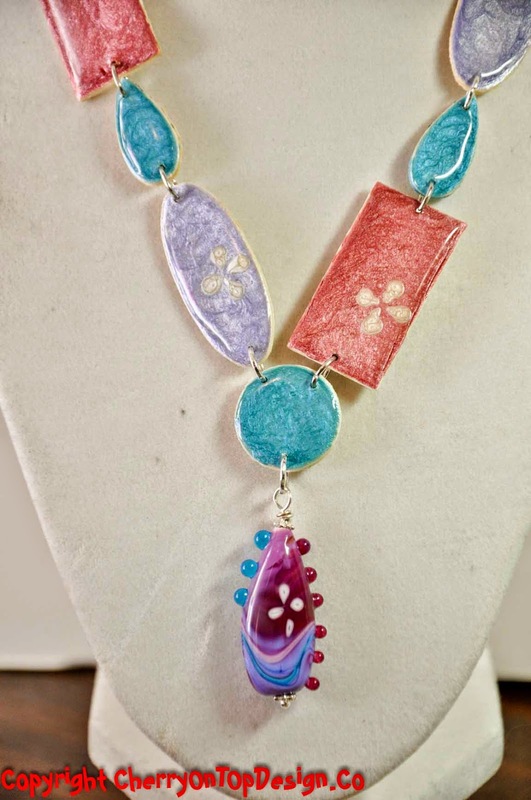 Great pieces Linda, you really rose to the challenge didn't you! And thank you for a fabulous Swap'n'Hop, I've really enjoyed it! Oh, Linda, I am so glad that Marica really pushed your "switch" button and got you to using the earthy colors! See what a good job you did with them? Don't you want to use more? LOL. anyhow, I guess my fav of all 3 is the convertible piece. 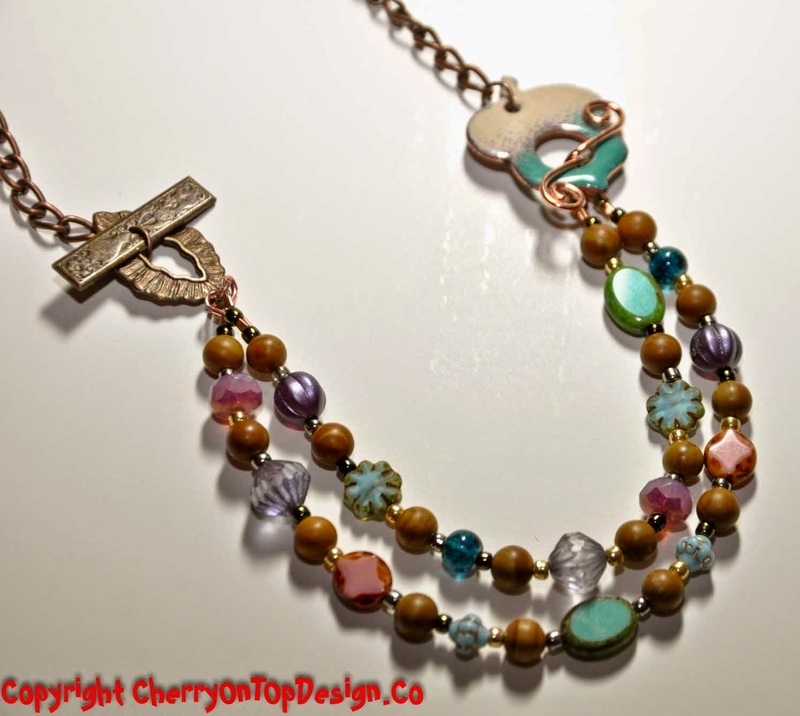 It's earthy and can be made into the bracelet and I love the combo of color and the clasp. Thanks again for organizing this and working yourself cross-eyed to make it all happen. You are my first stop. Now, off to my partners then yours. Nice work! Hey Linda, you are a superstar, thanks for organizing this challenge and blog hop! I like how you pushed your self to work outside your comfort zone. Your second necklace really Wows me, and even better that it converts to a bracelet. Thanks so much for putting this swap and hop together. So much fun. I love all the pieces, but especially the double duo. Linda, all your pieces are gorgeous. You sure rose to the challenging occasion and you have good reason to be proud of yourself. I love how you made them 'yours' from items that you felt are not so much 'you'. Thank you for hosting the swap, it is a great way to meet new artists and to push yourself beyond your own limits. 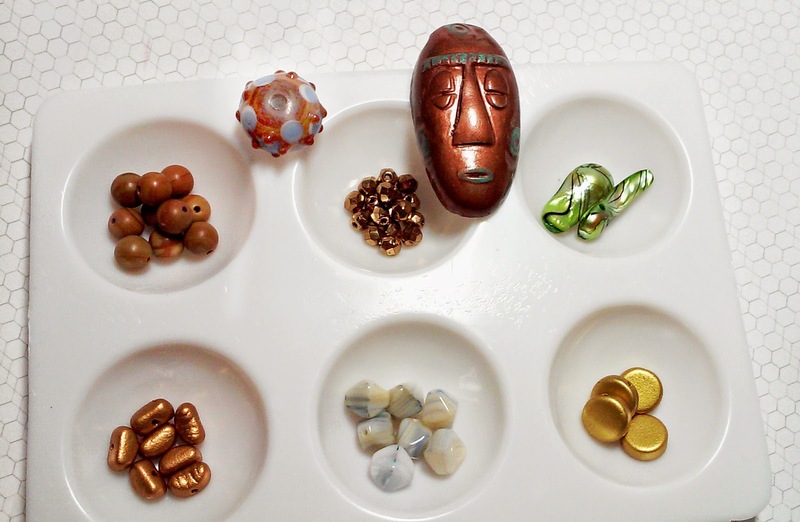 I love that tiki bead! The necklace that you made with it is perfect! It does it justice without being 'tribal'. The next necklace you made is brilliant! I love that you used two clasps AND that they are both different! They really set the necklace off and made it unique! I love side clasps anyway but that was sheer genius! 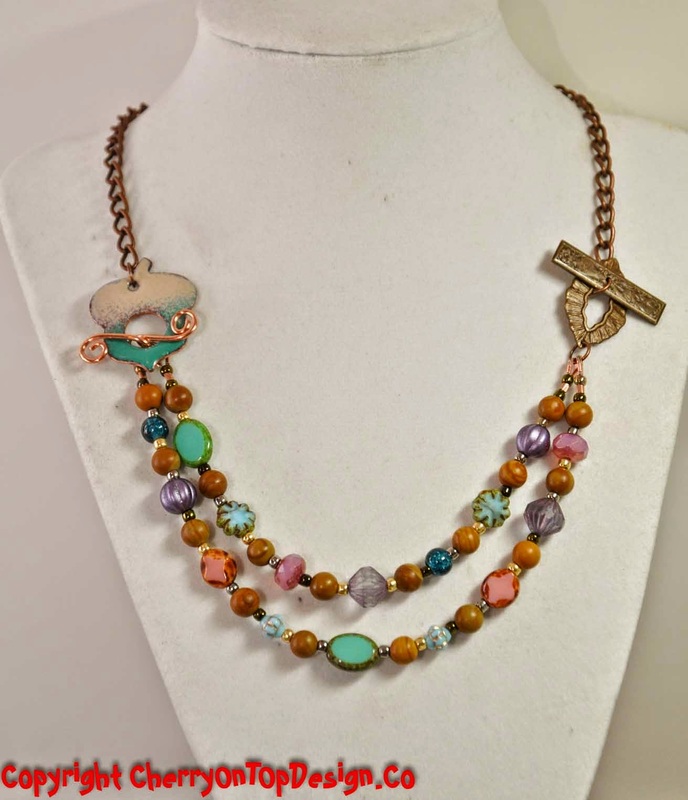 The necklace you made from Jessica's beads is probably my favorite out of the three, even though I love the side clasps, I love the colors and the way you used them in the third piece. What a breath of Spring! Hello Linda, huge thank you for hosting this hop . 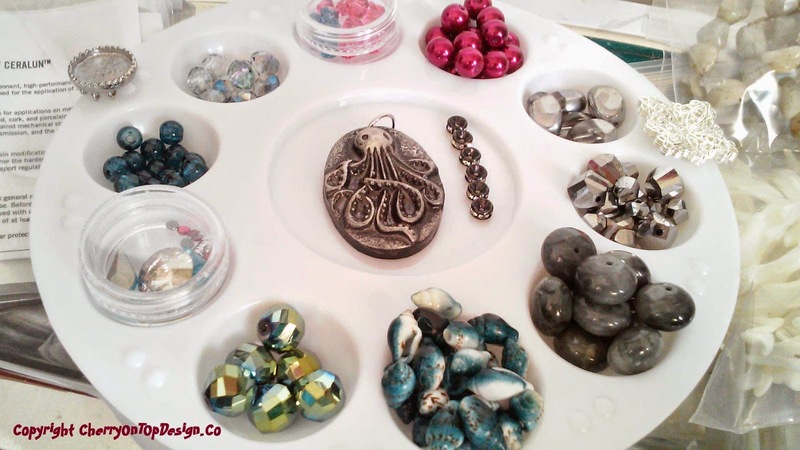 I am loving the items you made with the gorgeous beads. I love how you balanced up your Tiki necklace visually, and the convertible necklace is stunning. 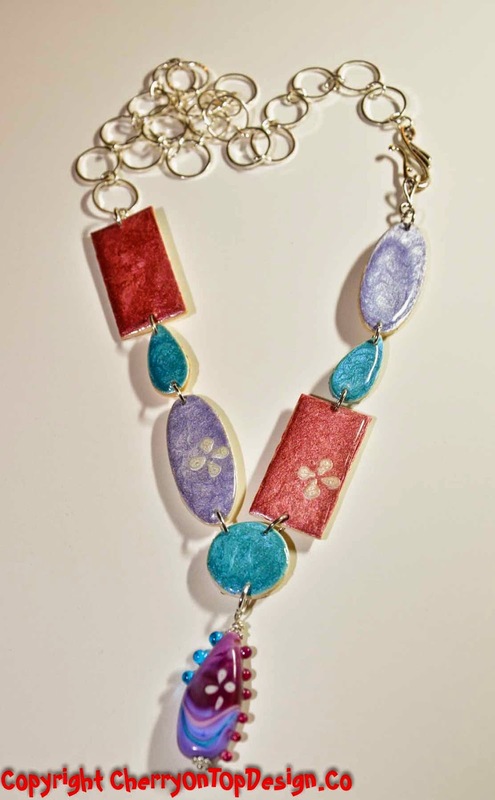 Love the wonderful colours and design in you third necklace . I like all of your pieces. But I really love your multi strand convertible necklace that transforms into a bracelet as well. Thank you for hosting this wonderful experience! I love what you did with the totem head! That necklace is gorgeous! I also love the necklace that is also a bracelet! So inventive! I wish I thought to do something like that! It's so cool! You're gonna revolutionize the jewelry industry! Thank you so much for hosting the Swap and for the awesome job of partnering everyone up - a truly monumental task! How pretty your pieces are! I love everything you created. Thank you for hosting this great Swap n hop challenge Linda ,I have really enjoyed it! Well Linda, you can relax now. I can assure you that this blog hop is a huge success and that's down to you. You did a great job as hostess and you deserve to feel very proud! Thank you!! Oh Linda they are all so lovely! The Asymmetric necklace is my favourite. Thank you for being such a fabulous hostess, this challenge has been so much fun and I have made a lovely new friend in Rosantia, my swap partner. You should be really proud! You are amazing! Very nice job and the two strand with double closure is my favorite . This was a blast to do, thank you so much!!! So beautiful and colorful. I have to say the 2 stand necklace is my fav. Thanks for hosting this swap and hop. Linda-You did a great job organizing this blog hop. I know it is a lot of work and you pulled it off beautifully. I am glad you were able to make so many wonderful pieces with what you received. I had a great time even though I am still waiting for my beads. I know that they will come and I will love them. I got so much enjoyment seeing how Claire met my challenge. What great Swaps you had. 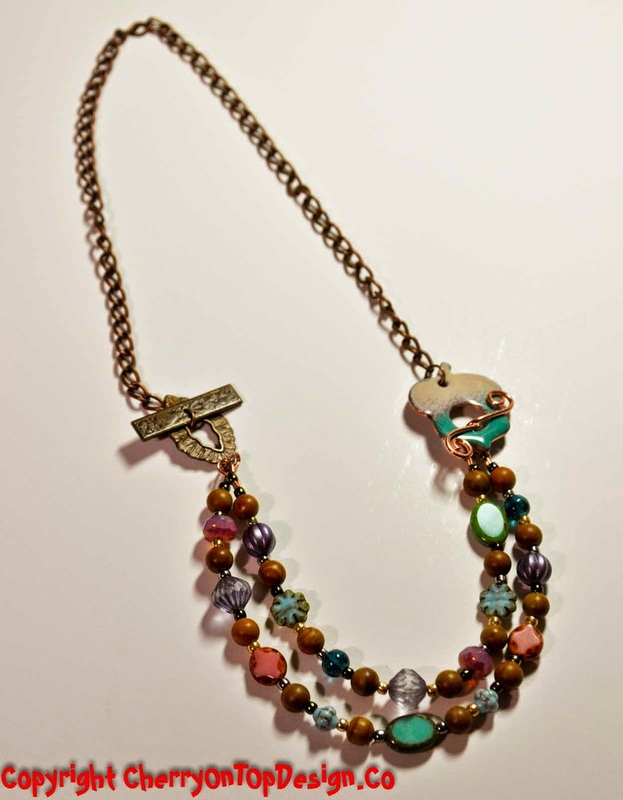 I love the multi-strand necklace the best but the other pieces are cool too! Great job! So much cuteness! The brown Tiki-inspired is adorable, and the colors on the second are fantastic! Thanks for hosting Linda... well done... nice job with all your pieces!Love the one with the side closure P.S. I finally figured out where the list was and how to cut & past. Many thanks for the wonderful job you did hosting this swap and hop. All your timely directions and helpful hints made it so easy to follow along. You definitely had on your designer cap in these creations. Love the fact that #2 could be worn as a bracelet ! I love Asymetrical and you had wonderful colors to work with. Beautiful pieces all. I can't possibly pick a favorite here. All such colorful and unique pieces but the Mua ha ha bead is my favorite! LOL. So fun and great selections. 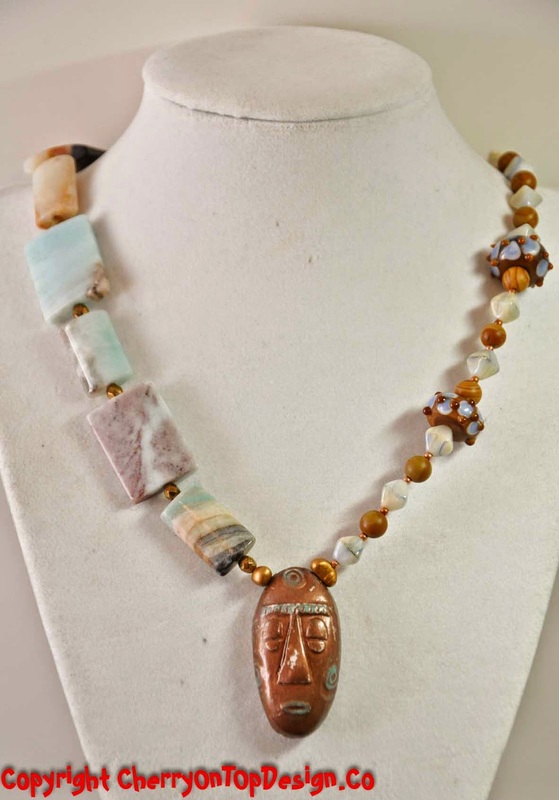 It takes the eye of an artist to choose the right beads among so many - you have found the right combo and balance for each piece. I really admire how you handled the Tiki - I get stumped in front of "human" beads. Those are Awesome designs Linda!!! Love the designs and the texture! The Necklace to Bracelet combo is Wonderful!!! Thank you so much doing such an amazing job on the hop and in your own designs!!! Be Blessed! Wow, what eye candy. I love the multi-strand necklace! Thanks for hosting. It's been a blast. I worked with pink, and for the first time ever, loved the result. Thank you for that. All of your pieces are great but I really love the versatile multi strand necklace. I live the total mix of beads. They work so well together! Thanks for hosting this fun hop. Necklace number 2 was my favorite. Very very beautiful! I think your designs just keep getting better and better! 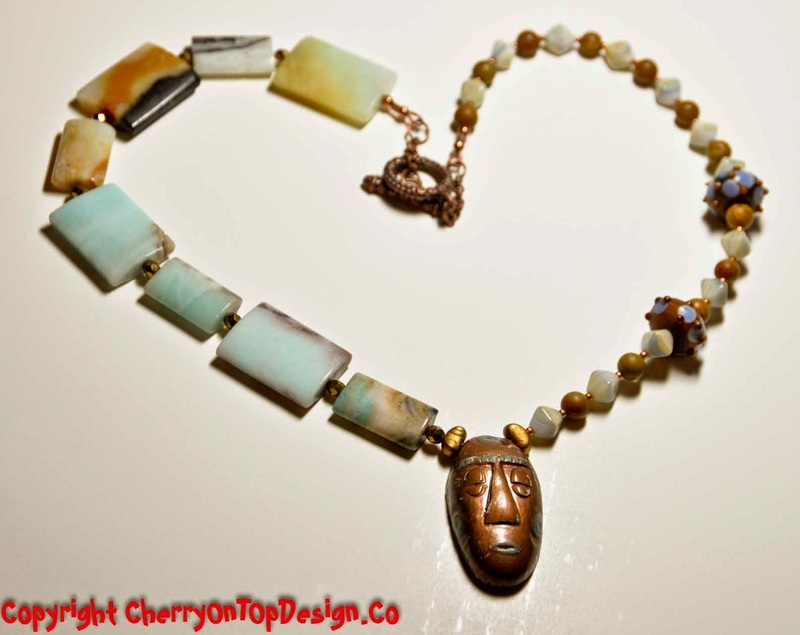 I LOVE the tiki head necklace! Asymmetric is difficult for me - your design just works!